examining packaging that catches our eye and sharing our insights with you. Sausage is one of the great food categories in my life. I am not talking about any old tubular treatment of ground meats that the industrial manufacturers provide but quality, well-crafted flavorful sausage. It is why I slow down at the sausage aisle to see what is new, different and exciting. First, I must state that it is not rocket science to observe that throughout any given store, various product segments or categories become dominated by specific color and packaging treatments, and although individual products may differ marginally in product features, they all start to look alike. For this reason, in order to set your product apart from the mass of color in its category, you need to be disruptive either with an innovative product, package design, color or configuration. You need to dare to be different. When I enter a grocery store, I enter as a consumer first. Like everyone, I am there to buy a product. But because I am more involved in product packaging than the average consumer, I tend to stop and take a longer look at the array of products rather than make an impulse purchase or blindly reach for something I normally buy. 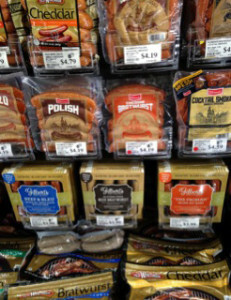 After standing and staring into the packaged sausage case, I was about to walk away when something caught my eye – there amongst the visual noise was Gilbert’s Craft Sausages. Instead of the standard package of 5-6 sausages vacuum-sealed in clear film packages, here is a clean, tidy box of sausage – something typically not seen in the sausage category. The carton features a simple, clean and straightforward “labeling” format, designed to appear as though it is banded in the same way handcrafted sausages used to be individually banded. Color-coded by product, the package is designed to look like it is constructed of butchers’ paper. The die cut creates revealing windows to the sausages in the carton while the concisely designed carton provides a structural integrity that isolates the product and provides order and clarity where the product is displayed. Comparatively, the surrounding vacuum-sealed packages appear to be jumbled in the display, obscuring their communication. The package contains all of the requisite size and content copy, however, it has been done with deliberate sparsity, delivering a clean, uncluttered look that efficiently guides a consumer through the principal package communication. To me, the package graphics are a blend of classic and contemporary elements reflecting the brand’s mission – to provide a crafted rather than processed product. But wait ­­– it doesn’t stop there. What is most surprising about this package is the unique single-serve packaging of the sausages. Finally, someone has recognized that consumers may only want one or two sausages at a given time. Simply tear off one and voila – great tasting, instantly gratifying, portion-controlled servings of great meat. The rest remain safely packaged for future use. My only recommendation is to be clear and sharp with the product photography on the back panel of the package. The composition of the styling and the clarity of the printed image should reflect the quality of the food on the inside – if you are going to have the image on the pack, make it work harder for you. Nevertheless, this package represents a combination of effective structural and graphic design and disruption in its category. 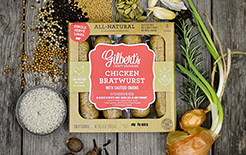 As both a personal and professional advocate of transparency in food packaging and keeping consumers informed of exactly what is in the food they are purchasing, I believe Gilbert’s Craft Sausages does this while standing out in a very crowded category. If you are looking to stand out from the crowd, we invite you to check out our packaging design capabilities and click here or to contact us at 920-725-4848. Hi Kris – this is Kyle, Gilbert’s in-house designer. Thanks for your kind words and constructive criticism about our packaging, which funny enough is printed in Neenah. We’ve got a design refresh along with a few new products hitting stores this month. The single-wrapped links are unchanged, the box is moving from a tuck-tab to a self-folding box for a new automated packaging process, and we’ve cleaned things up a bit with the graphics. The craft paper is being replaced with a soft ivory, and the typography is cleaned up and looking a bit more classic, I’d say. As you know, staying ahead of the curve is a never-ending process, and as the bigger corporate brands start to occupy our visual space we need to keep resetting the bar to help consumers identify ours as an independent, higher-quality product.